Never make a decision when you're feeling lonely. Desperate actions lead to regret. We want something desperately and we try to force the God to give it up before it is ready. We want everything now. That is the devouring self. I choose to be single because I'm not desperate be in a relationship. And in the end, we are only atoms. Drifting alone, desperate for something to cling on to. But your thoughts, sad as they are ('One star, one string, and all the rest, darkness, and everlasting space . . . .') are not made of atoms (. . . . . 'save that she shelters in her breast'). Look up the rest, if you would. This is not made of atoms. Some situations may push you to become desperate but don't forget the virtue of patience. Keep practicing it. Never allow yourself to be so desperate that you compromise to end in settling for far less than what you deserve. You must honor your inner self. Be not a person of circumstances but be a product of self right decision. Never allow yourself to be so desperate, that you end up settling for far less then what you deserve. Patience is not just the avoidance of desperation, but the courage to wait for the best in the midst of serious desperations. 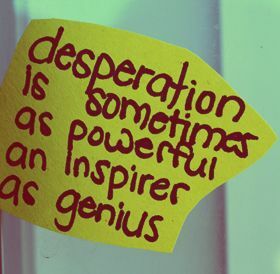 Desperation and defeat does not dwell in the hearts and minds of those who know and believe that God's got it. Desperation can also be a source of negative popularity and make you notorious, especially when your desperation is evident on through your body language and people can perceive it with ease. In the words of Douglas Hourton, “Desperation is like stealing from the mafia. You stand a good chance of attracting the wrong attention.” So, if you are desperate for something or someone, keep it within yourself. Don't get vocal about it.